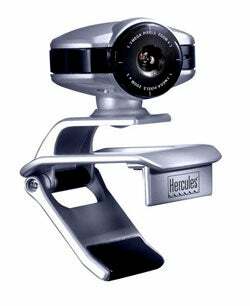 Now you can make your own version of Cranky Geeks starring you, your brother, and the dog you nicknamed "John C. Dvorak", with this Hercules Dualpix HD webcam. The 1.3 megapixel video sensor gets you 30FPS of high definition goodness, plus 3x digital zoom and even 5 megapixel stills. The clamp on the bottom allows you to attach the webcam to both LCDs and CRTs so it won't fall off mid-show. The bundled software, "Station Evolution", gives you features like "Burst Mode, Infinite Images, Emotion Delayer, and Travelling-Zoom." Give me a call when it's available in October and I'll even be a guest.